Charter schools seek to fulfill specific missions, which were identified by the original school founders. Through The Compass School charter, we are defined as a multi-age learning community which fosters a passion for learning in all students so they can reach their full potential. 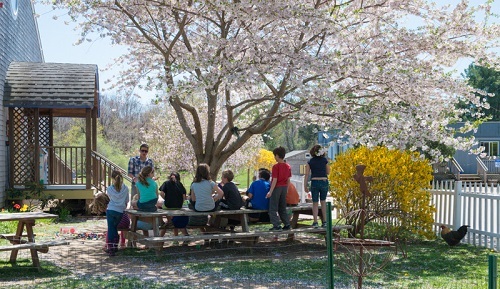 The school utilizes a project-based curriculum integrating academic disciplines, emphasizing social responsibility and environmental sustainability. We do this work in small classroom settings to prepare each graduate to be a responsible citizen in the global community. Charter schools are public schools; we are funded by tax revenue from the towns in which our students reside. In addition to this funding, we also receive federal grant monies, just like traditional district schools. There is a lot to learn about the regulations and characteristics of charter schools. While the websites listed here are helpful, families may have further questions. The Compass School staff, particularly its director, Brandee Lapisky, would be happy to discuss this topic with you. Please reach out via email at director@compassschool.org or by phone at (401) 788-8322. Our FY19 budget is available for public view and can be found by following this link.